So, it’s been a few minutes since I blogged. I have A LOT of catch up but before I get completely overwhelmed I thought I would share with you all the amazing opportunity I was given to rep a luxury jewelry line out of Ojai called Les Bohemiennes. I have been a big fan of Deb Michelle’s company for a long time and I am so honored I get to share it with you all! The whole line is meant to be layered which means there are thousands of ways to wear it and so many looks you can create. 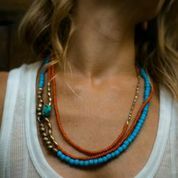 All the pieces are handcrafted using vintage glass beads, brass beads, and other beads handmade in Africa. If you are a retailer and would like to set up an appointment to view the line you can contact me directly at nicole@myworthwhilestyle.com.